The R16 is an easy-to-use portable recorder with plenty of channels and acceptable quality at a good price. 16-track digital recorder. USB audio interface and control surface. Bundled with Cubase LE 4. A few features are a bit fiddly to operate. Recording quality is acceptable rather than outstanding. With the R16, Zoom is offering a modern alternative to the classic hardware multi-tracker, using an SD card for storage rather than the built-in hard drive we'd have seen in similar products a few years ago. As we saw with the launch of Cakewalk's Sonar V-Studio 100 last year, manufacturers are now looking to add value to the basic recording unit, and Zoom has followed suit by designing the R16 to double up as a USB audio interface and control surface. The R16's plastic construction gives it a surprisingly light feel, but the case is still tough and will stand up to any reasonable use and abuse. At just under 38 x 24cm from above and weighing in at 1.3kg there's no questioning the unit's portability. For battery operation, you'll find a slot for six AAs underneath. The unit can also be powered by a DC adapter or run via USB bus power when connected to a computer. In addition to a basic package of nine digital effects, the unit also hides a couple of handy extra tools that should make the recording process run more smoothly. The onboard metronome can be routed to all outputs or sent to the headphones only, which could come in handy as a click. Meanwhile, the built-in tuner features a huge number of guitar tunings and can also be set to tune to any frequency. The darker grey handles on the ends of the R16 not only act as protection for the exposed controls on the top of the unit, but also house a pair of microphones which can be used to make quick and easy stereo recordings. A 1GB SD card is provided to get you started, but the R16 can handle anything up to 32GB in order to increase recording time. The R16 features eight mic/line inputs on combo XLR/TRS sockets, with switchable 48V phantom power on two channels and a high-impedance option on one input to allow a guitar or bass to be hooked up directly. Recording is pleasingly straightforward, with eight very basic channel strips, a master fader and a dedicated transport section. The push buttons above each channel fader toggle the track between play, mute and record. Up to eight tracks can be recorded simultaneously, but it's also possible to link another R16 up using a standard USB cable, allowing 16 tracks of simultaneous recording. Once you've recorded to the first bank of eight tracks, you can switch the unit to tracks 9-16 at the push of a button. If you already have audio on some tracks and want to record a full eight channels at a time, moving recordings from one track to another is a little more fiddly, requiring you to dive into the R16's menus. "The R16 offers very little in the way of editing functionality and focuses more on mixing." The R16's talents extend beyond recording; it serves as an 8-in/2-out audio interface (at up to 96kHz sample rate) and basic control surface for your DAW when connected to your computer via USB. We applaud Zoom's thinking here. 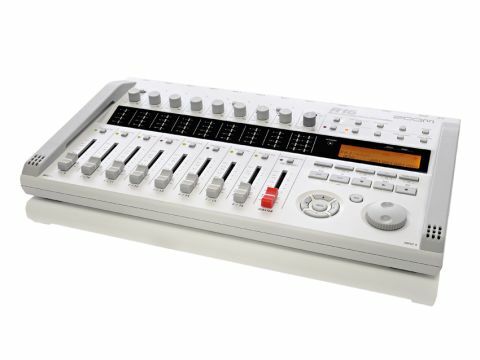 All-in-one hardware recording units may offer a neat solution for multitracking and location recording, but when it comes to the mixing process, a small LCD screen simply can't compete with the easy workflow of a DAW, not to mention the fact that DAWs open up a number of more advanced processing options. The R16 offers very little in the way of editing functionality and focuses more on mixing, which we think is a wise decision on Zoom's part. Recordings made with the R16 are stored as 16- or 24-bit 44.1kHz WAV files and the results offer very good sound quality. The preamps are nothing to write home about but acceptably clean and quiet for a unit at this price level. Although the onboard mics could never be described as high-fidelity, they're good for quickly jotting down ideas without going to the trouble of setting up mics or signal routing. The R16 comes bundled with a copy of Cubase LE 4 for Mac or PC, now slightly outdated but still a worthwhile introduction to working with a DAW and easily capable of carrying out the editing tasks the R16 omits. Templates are supplied for Cubase that make it even easier to drag and drop your recordings into a new project. When connected to your computer, the R16 works well as a controller and interface, although the lack of physical controls on the unit is slightly limiting in terms of DAW control, essentially restricting you to transport control and channel faders. It would be nice to have more assignable rotary controllers. The stripped down nature of a simple portable unit such as this inevitably means compromises have to be made with its design. It would have been easy for Zoom to add dedicated buttons for every function but that would have resulted in a much bulkier unit. Unfortunately, the downside of this is that, with just a few buttons to play with, things can get a bit fiddly when you start carrying out more advanced tasks such as adding effects, panning tracks and mixing your recordings. Panning tracks on the R16, for example, requires you to select an individual channel and then use the jog wheel to adjust its pan setting. If we were bring picky, we'd say it would be nice to have another soft rotary pot for each channel strip. This could be assigned to the variable you were editing and would make it a lot quicker to carry out some of the R16's more complex tasks. On the whole, though, Zoom have got the balance between size and features just about right. The design of the R16 ensures that it's both portable and functional. What's more, with the ability to record eight tracks simultaneously and the option of using the onboard mics for quick results, the R16 is versatile enough to suit most people's recording needs. The thing we like most about the R16 is that it takes us back to the days before DAWs, when cassette Portastudios ruled the bedroom. Having the simplicity of a standalone recorder is one of its strengths, and the R16 manages to combine said simplicity with a number of more advanced features that make it a great portable recording solution as well as a handy addition to your computer setup.